This pattern was designed by Amy Walsh for Blue Underground Studios. 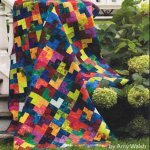 The Crown Jewels quilt was created with an assortment of bright blenders from Frond Design Studios. Baby or Wall - 40.5" x 48.5"
Lap or Throw - 56.5" x 72.5"
Twin - 72.5" x 84.5"
King - 104.5" x 120.5"
The blender pack included in this kit has 34 different Frond Designed fat quarters! That's enough to make the Twin sized quilt, and still have some left over to play with!